These master brewer equipment kits are for the brewer that wants it all! 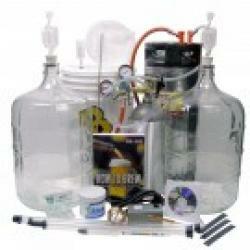 Browse our master brewers kits and choose from Master Brewing Kits for pro level home brewing. program. Please note that due to shipping regulations that the Co2 tank must be shipped empty. Price will be adjusted accordingly if shipping. 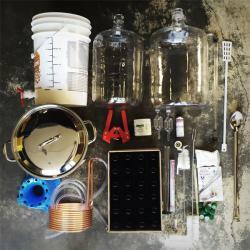 Get started in homebrewing the best possible way, if not the ULTIMATE way, with our Ultimate Brewing Starter Kit! This kit is called our ultimate kit for a reason. 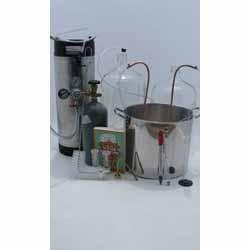 It comes with all the equipment you will need to start making and bottling beer at home. From the 7.5 gallon brew pot, two glass fermenters, wort chiller, to the two cases of bottles - you'll have all you need to make great homebrew from day one. No need to come back time and again for equipment you might need, we've got you completely covered! All you'll need is a stove top. It also comes with our custom instructions, which will introduce you to your new equipment and explain how it can be used and maintained. Brewing, measuring, transferring, cleaning, and bottling...you'll be able to do it all with the Ultimate Brewing Starter Kit; the most complete starter brewing kit on the market for under $400! In addition to all the great equipment, we've made things easier for you and personally selected three beer kits to choose from for your first batch. They're great tasting AND easy to brew! You will need a heat source such as a stove to use this kit. While a gas range is preferred, an electric range will work as well. You could also try an awesome propane gas burner for ultimate heating power!